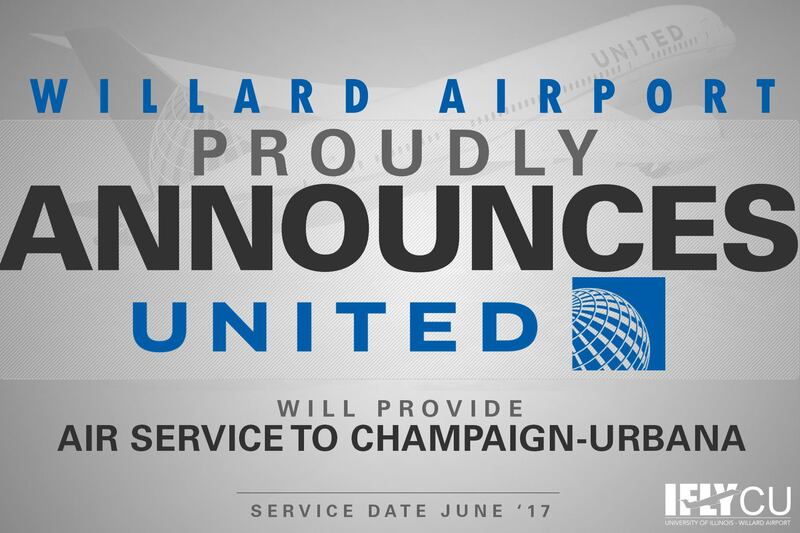 Starting June 8, Champaign-Urbana air travelers will have a new option: United Airlines. Three new flights in and out of Champaign-Urbana’s Willard Airport will be added, all to Chicago O’Hare Airport. Passengers already can start booking United Airlines service. Tickets can be purchased at www.united.com. United Airlines would be a new airline for Willard, which has operated exclusively with American Airlines since Sun Country left in 2014. United is the first major airline to join Willard since Delta Airlines, which stopped service in 2010. Gene Cossey, Executive Director of Willard Airport notes that increased air service is a testament to the community’s support of Willard and the airport’s continued commitment to serve the region. Willard has worked to provide additional options for passenger convenience as United Airlines does not currently serve any other airport in the region.